Peter Davis is best known as the music teacher of Louis Armstrong. Much of his life story is found in interviews. The exact date of his birth is uncertain but he recalled in a 1965 interview having been born on October 25, 1887 near the French Quarter in New Orleans, Louisiana. Other sources claim his birth was in 1880. No discernible information could be found on the Davis family except that the census data indicate that the father listed himself as a widower and a day worker. Davis was first introduced to music training when he took lessons from the celebrated music teacher William J. Nickerson beginning in the late 1890s. Davis learned the piano and then the cornet. By the time he was an adult, he was training other students. The music teaching career of Davis began around 1912 when he was hired as the warden at the Colored Waif’s Boys Home and soon after became the Director of Music. The facility was used to house African American boys who had been incarcerated by court order. Most of his students were given lessons on the cornet or the trumpet. However, many more took lessons on a variety of instruments including the piano, clarinet, bass tuba, saxophone, snare drum, bass drum, and the trombone. 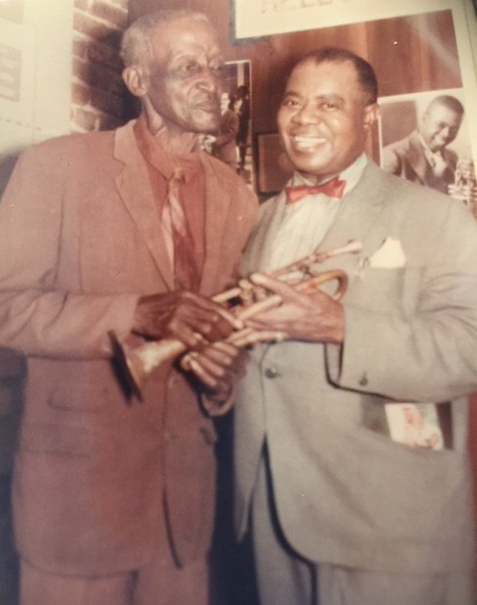 Although Peter Davis taught thousands of youngsters during his life time, he never became as well-known as his most famous student, Louis Armstrong. Yet in nearly every article and book published on the life of Armstrong, prominent acknowledgment is given to Davis who had the ingenuity to recognize the innate talents of young Armstrong before others did. Some of Davis’s other students included Dave Bartholomew, Henry “Kid” Rene, Willie Humphrey, Percy Humphrey, Danny Barker, Chester Zardis, and me, Robert Mikell. Davis taught my brother, Calvin, how to play the trumpet and he taught me how to play the drums. Davis was also one of New Orleans’s better-known musicians from the World War I era to the 1960s. He played numerous instruments in a variety of venues across the city and always seemed busy with engagements until his retirement in 1949. Upon his retirement from the Waifs Home, Davis then volunteered as a scout master in the African American community, leading scouts on camping and hiking trips through the woods in and around New Orleans, teaching them survival skills during the mornings and in the afternoon, offering music lessons to the interested boys on an instrument of their choice. Peter Davis died on April 29, 1971 in New Orleans. He was reported to have been 90 at the time of his death but more likely he was 83. George Kay, “The Finding of Peter Davis,” The Second Line (Spring, 1971); “Peter Davis, Jazz Teacher, is Dead at 90,” New Orleans State-Item, April 30, 1971.